The multi-touch issue surrounding the Sony Ericsson Xperia X10 has been one of the key talking points since launch. Sony Ericsson continues to confirm that the handset does not support multi-touch in hardware or software, whilst there are a number of others who refuse to believe them. A number of videos have appeared over the last 24 hours that certainly give credence that at least dual-touch may exist in some form or the other. 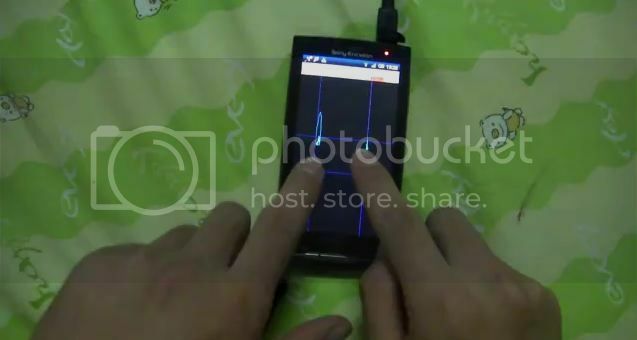 The first video below, originating from China, seems to show two touches registering simultaneously, which if not real is an elaborate fake. All of the videos are apparently on an Android 2.1 equipped Xperia X10 so it’s difficult to know whether this is something to do with the new OS or some kind of custom ROM. The guy who uploaded the last video below (Youtube member aznelite89), says that multitouch is working and is based on the firmware update. It says he is using an unofficial ROM and is testing it to make sure it is stable before releasing it. He goes on to say that that the Xperia X10 is running firmware version 2.1.0.6439. Remember, we yesterday saw version 2.0.A.0.453 certified by the PTCRB. Anyway, we’ll keep an open mind until we get a chance out the Éclair update for ourselves. Until then check out some video evidence below. Dont care my x10 dont get the multi touch..
this seems to be the game changing things for sony ericsson and the lack of knowledge of se. whaterver will be the result of update i am loving the dilemma between user and manufacturer. hope for better os in comming days. don’t know what to believe! may be a custom software, although SE said the hardware doesn’t support it. whats going on? Same happened for the samsung spica i5700. Here samsung also denied multitouch cap while an xda dev released dualtouch capability. Maybe it’s a chinese counterfeit x10. And for those who say you don’t want multitouch, well you are all ignorant fools. I still don’t understand how he managed to load the ROM, with the boot loader locked. Well if you ask me i recon S.E should hire this guy thats created the custom ROM as he obviously knows more about this phones capabilitys than the manufacturer does. If he can then get both the incall and ringer volume levels increased in his ROM then I know where all my future updates will be coming from. On a negative note however I agree with Jackal on this one…hows custom roms possible with a locked bootloader. Exactly….If any had the bootloader cracked, we would have known. Because that would be a VERY big achievement…. I think this is great! All the SE fanboys are scrambling! Saying they don’t want MT! Saying that it has to be fake. Ha ha ha ha! They are all in denial! It’s easy guys, he obviously has the bootloader cracked and hasn’t shared it yet! Very simple. Of course trying to tell a die hard SE fanboy that their beloved SE lied to them is next to impossible. There’s no way SE would say that it wasn’t capable and then a of a sudden proved wrong? Even with all the “false” advertising done on the fact that it had MT (AT&T online add anyone?) and then the denial, ha! It doesn’t matter if you want MT or not, if you think its great for the phone or not. It is so obvious, SE lied to all of us plain and simple. Yeah, SE “make.believe”, nice slogan. I believe person whi already tried 2.1 build has already confirm tyat there is no MT support so I believe this is custom build. it seems there are more videos out there.. check this out.. This is not a genuine X10… it’s a Chinese FAKE. And I assume the others are too. Wouldn’t be surprised if Sony got the screen from varying sources, some with multi…some without because of manufacturing problems and then disabled it across the board as to not upset people who have a non-MT capable screen. Ok, my fault… Didn’t even see the 2nd video. @Desarth Really don’t know what you’re babbling about. You do realize that you can move the lace around, don’t you? It seems to me that most of the lace in the first video is just under the phone. I think they keept denying that the device supports multitouch so far because they are afraid of Apple filing a lawsuit for patent infringement. Well, that’s the only _logical_ reason I can imagine. As for those that claim they don’t need multi-touch: they probably never played a decent 1st person shooter or emulator on the device. I’ve already accepted the fact that I would never be getting multi-touch on my Xperia X10, but seeing these movies makes me optimistic that, even if Sony Ericsson decides to disable multi-touch, some clever hacker is going to find a way to enable it. The lace goes to exactely the same place as on my X10. And mine is not a Chinese fake..
@Yogarine yeah i thought that of that too. HTC samsung etc are already sued .______. Anyway you look at it this is interesting for us X10 owners. Perhaps we will have both 2.1 and MT in a couple of months? Apple threaten to sue SE if they added the multi-touch? We all know that SE all way long has said that the X10 had a hardware limitation to the display, so that it could not do any multitouch at all. If this article is right. Then SE has been lying to their costumers. Then SE has a serious reliability problem. SE is big enough to pay Apple for the patent of multitouch so if that is the only reason tsk tsk…! I cant see if the phones on the video is fake or not. I hope they are for SE’s sake. Dont you just love that blanket? it wouldn’t be the first time that SE lies to us. Another thing, you mention that SE has enough money of buying MT patent from Apple. That may be true, but let me point out one thing: in the end of the day, there’s only one thing that counts, and that’s profit. Sure, SE could. But adjusting the content of your communication is much cheaper than buying a patent from another company. Know what I mean? The multitouch debate began as a result of a post from Sumit Malhotra on the official X10 product blog I believe back in April. He mentioned, multitouch was to be considered for future updates. This was a factor in my decision to purchase the phone having had an HTC Dream prior. Andro 1.6 does not support multitouch. It has been impossible to test the unknown features of the phone without the holy grail bootloader and custom roms. The closest I’ve been to multitouch on my X10 is by holding the shift key on your standard keyboard and touching the screen with another finger. The effect seems to be a result of the dual touch. I am not a programmer. I am just a consumer so I don’t claim to understand the complexities. Who knows? Maybe SE will sneak the capabilities in there. When we have 2.1 most of the apps/games that we have support multitouch. Maybe SE will claim that it’s the App Maker’s fault for supporting this feature if there truly is the Apple patent on it. The videos seem to offer some evidence of multitouch but in one it appears to be the old SE one touch zoom. I have a jpeg viewer that has this feature. We should find out what it says on his phone. Is it in Cantonese/Mandarin? Someone here must know. Please post. It may offer some evidence of its authenticity. What is the code he put in? Maybe XDA has answer. Enough of my rant. You know where I stand. I am anxiously awaiting updates on The Update so if you have any updates please update us all…Peace. maybe this is the surprise they were talkin about last month? As I said time and time again, the phone can support it but SE doesn’t want to pay for the license!!! Certainly an interesting development. I suspect there is no Multi-Touch because of legal issues and that Sony have released a similar but different feature to avoid patent infringement. I know other manufacturers have Multi-Touch, but something does smell fishy. Maybe Sony Ericsson is getting back at all of us XperiaX10.net users who have been bagging out the slow release of Android 2.1 and it’s subsequent lack of features by with-holding important information. Another thought could be that a updated hardware revision with the X10 HD going on sale, perhaps this has an updated touch panel? I can’t get my hands on this firmware fast enough..
Dude, unless you already have 2.1 on your phone, don’t you dare say that. 1.6 does not support multi-touch so your little experiment is pointless as the x-10 in the videos are running 2.1. You can see by the homescreen that has a live wallpaper. in writing, mandarin and cantonese are exactly the same haha! That isnt multitouch, when you touch it, it auto zooms with one finger. On my x10 pinch zoom WORKS when using google maps and zooming in, zooming out does not work… so i am pretty sure this is not a hardware limitation! holy cr*p. You’re right!!! pinch zoom in does work for google maps. hmmm it must be software related. Sorry, but you’re wrong. Opera Mini reacts on one of your two fingers. In case many people haven’t heard, XDA developers took a look at the kernel behind the X10, and found multi-touch drivers. They are there. SE said that the X10 wouldn’t support MT due to hardware limitations. So, it’s not about drivers. Strangely enough, MT zoom in in google maps does work. But I have to admit that SE’s implementation of zooming (see article above) sounds promising, too. Pinch zoom in Google maps seem to be double tap rather than MT, at least thats my feeling when trying. its quite funny about sony ericsons multitouch on the x10. i have the x10 mini and i have actually bben experiencing multitouch zoom in and out with my pictures but there is no telling when it actually works. i have tried it in google maps, on webpages and with pictures in my phone. regarding the pictures i cant remember if i used the album app that came with the phone, or if it was one externally downloaded. but the hardware is clearly capable of multitouch, but its really not too stabil. i have to say im running the original 1.6 version that came with the phone. strangely, no one is here to confirm whether MT is working on the 2.1. I’m on 2.1, but no MT! WTF? What about that guy in the vid? Hi, m unable to vu clear picture in mediascape (JPEG) file. I v text contents in it. Can anyone solve this issue. I hv android 2.1. Previous post: New Xperia X10 ‘2.0.A.0.453’ firmware approved – Éclair release imminent?